Beautiful Faberge Style Egg Shaped Boxes! Well, I just found out that Faberge makes the most beautiful jeweled and colorful egg shape boxes!! I came across these sparkling egg boxes and I went crazy!! Many artists nowadays make Faberge style egg ring boxes and trinket boxes, and they are all beautiful and fancy looking!! (I read in a book that these Faberge eggs actually are supposed to represent the most pure angel being born! Of course what called my attention were the colors!! Faberge egg boxes are the most colorful and “sparkly” egg boxes I have ever seen! They are usually set with sparkling Swarovski Crystals and hand enameled by skilled artisans. They make gorgeous gifts to anyone who likes to decorate their home with exquisite and unique art! 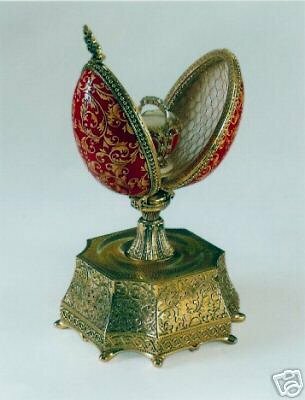 *The original Russian Faberge eggs were created by Peter Carl Fabergé. The one in the picture above is a stunning musical egg box cast in 22k gold, bronze and porcelain that opens up to reveal a ruby red egg inside! 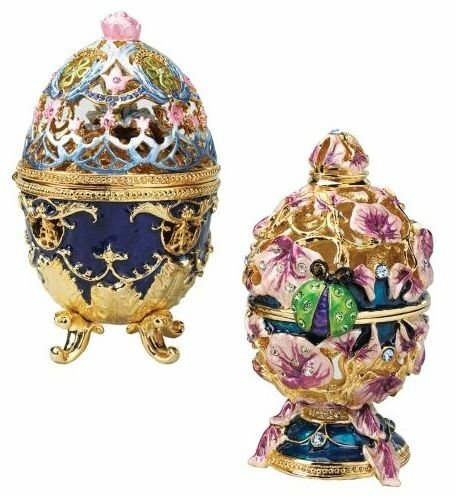 Unique Faberge Egg Shaped Boxes for Sale! What called my attention first when I saw these Faberge style eggs were the sparkles and colors!! 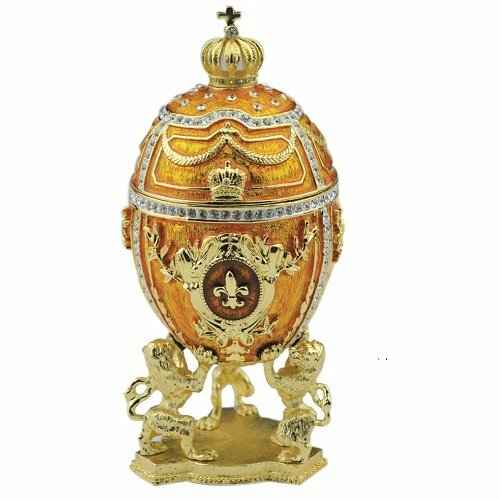 This gorgeous golden Faberge-style decorative egg box is also musical! It plays “Magic Flute” from Mozart! It is fairly large too, at almost 7 inches! Beautiful Set of Two Faberge-Style Enameled Eggs! 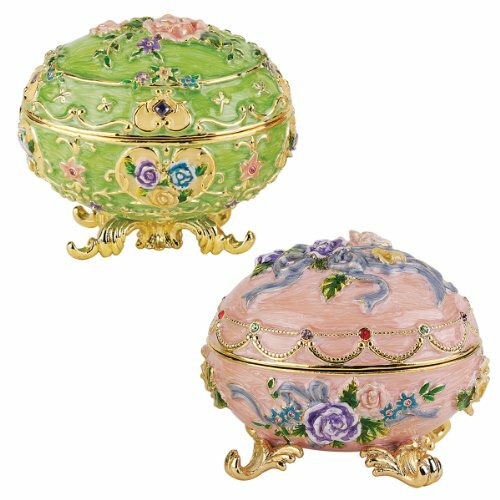 You will be getting TWO gorgeous colorful Faberge-style egg shape boxes! They are about 5 inches high each and they open up to reveal a pretty nice space inside them to keep small trinkets, earrings and rings. *Another stunning Faberge-Style collectible enameled egg! This is a gorgeous, heavy and fairly large (at about 9.5 inches high) Faberge inspired Empress Galina white, gold and blue egg-shaped box for sale! 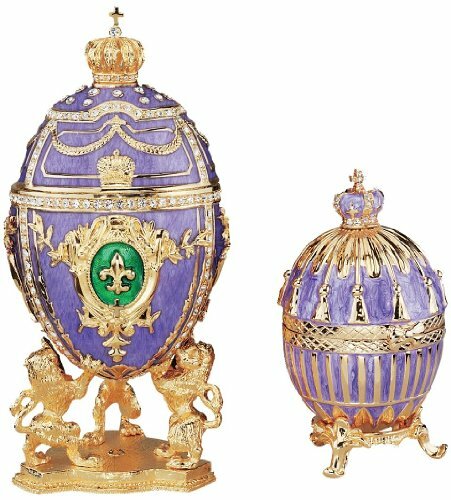 According to tradition, each Faberge egg had to contain a special ‘surprise’ inside them and you can also place your very own special treasure inside one. It is so beautiful and eye-catching that it definitely deserves a nice spot in your living-room or dining-room! 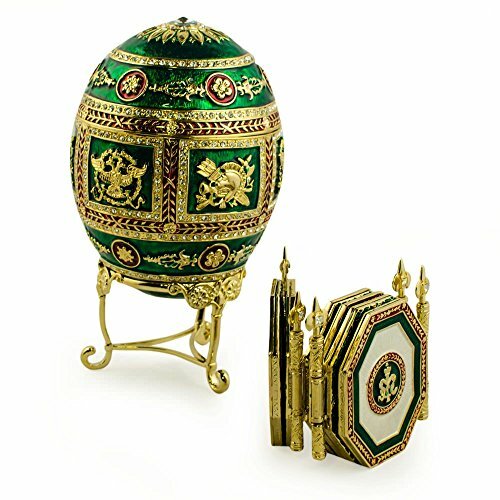 Another impressive Faberge inspired egg box in a gorgeous emerald green color and yellow gold! The Napoleonic Russian Faberge Egg represents Russia’s victory over the armies of Napoleon! It stands about 6.5 inches high. *Very Cute Floral Birds Egg Boxes! 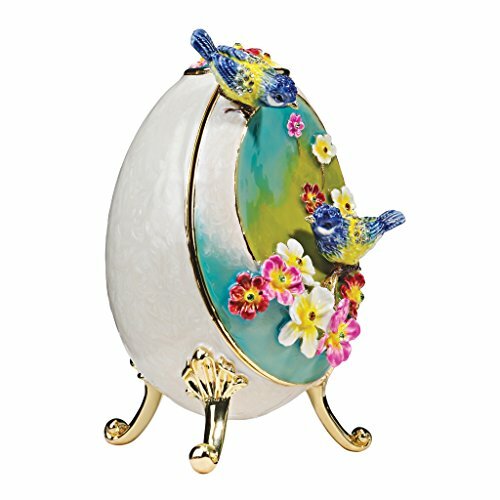 This is a very cute floral Faberge egg box that also has cute birds all over! You can also choose to get the set, which comes with TWO different ones! Gorgeous Purple Floral Faberge Egg Boxes! They are each one more beautiful than the other!! 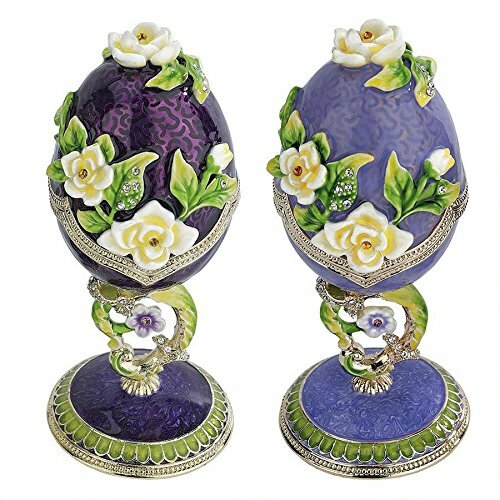 These gorgeous purple floral Faberge egg boxes make a perfect spring gift idea! This is a very cute and tiny purple and gold Faberge inspired egg box for sale. It is about 3.5 inches high. Will make a beautiful Easter gift idea to someone special! *The very first Fabergé egg was crafted for Tsar Alexander III, as a gift for his wife in 1885. 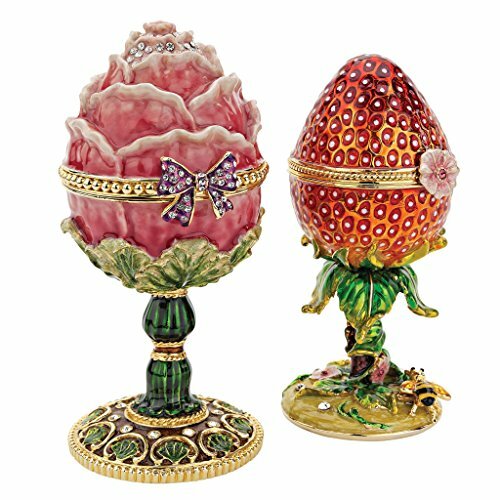 I couldn’t resist showing you these cute and tiny light green and pink floral Faberge-style eggs! Will look amazing on your bookshelf or side table! They are each very detailed! These are among my favorite cute Faberge-style eggs for sale! I love the cute green ladybug accent and all the pink flowers on it! 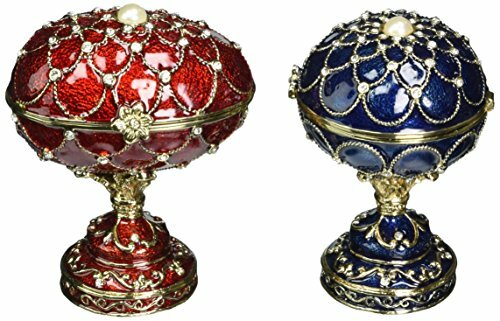 *Red and Blue Collectible Royal Russian Palace Faberge-style Enameled Eggs! Another gorgeous set of two stunning Faberge-style eggs for sale! I love the beautiful colors and the exquisite golden details! They are each about 4 inches high. *Did you know that Faberge eggs represent wealth and opulence in popular culture? *The Most Gorgeous Faberge Style enameled eggs in my opinion! 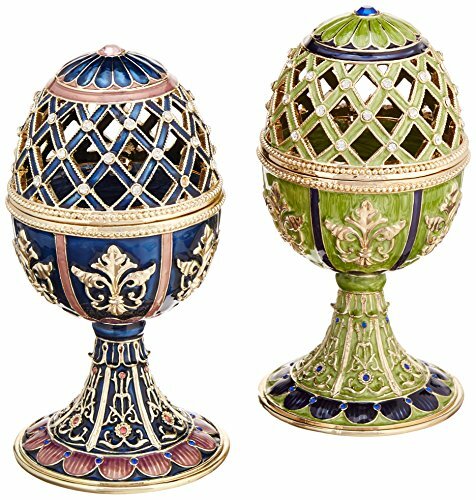 And since I usually like to save the very best for last, here are the two most gorgeous, cool and unique Faberge-style egg-shaped boxes for sale! I also love their size! They are about 5.5 inches high! *Very interesting documentaries about the Faberge eggs! If you have time on your hands and want to learn more about these exquisite Faberge eggs, here are some great documentaries! It is divided in 4 parts.